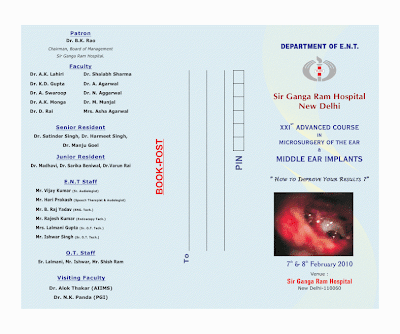 We invite you on behalf of the ENT Department at Sir Ganga Ram Hospital to come to Delhi and attend the 21st Annual Workshop on Microsurgery of the Ear & Middle Ear Implants. The 2 day course is from 7-8 february and by then the weather should be pleasant and we are keeping to our tradition of having an informal atmosphere where the participants are free to ask questions during the surgeries to clear their doubts. A minimum of 8-10 cases will be operated upon and the course will also include demonstration of a temporal bone dissection by Dr A K Lahiri. This will be of great help for the students of ear surgery in improving their concept of temporal bone anatomy.